Create NSW T: 02 8289 6533 E: mail@create.nsw.gov.au W: create.nsw.gov.au Create NSW is the NSW Government’s new arts and cultural driver, which brings together arts, screen and culture functions in a new integrated entity. 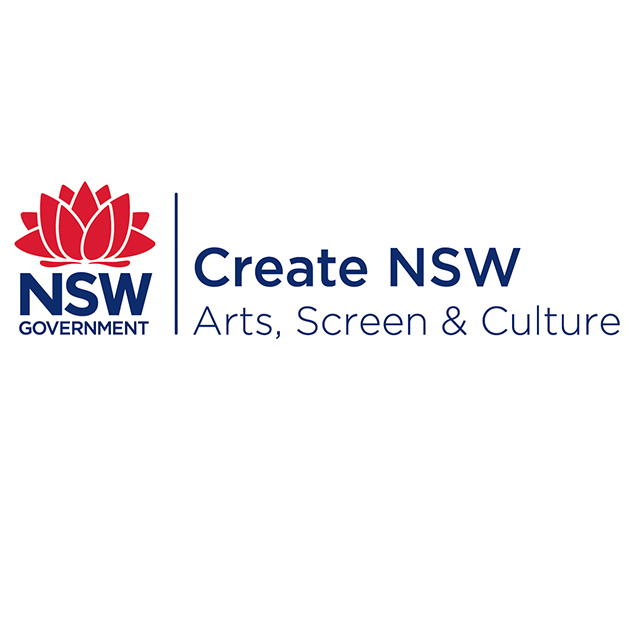 Create NSW was established on 1 April 2017, and has responsibility for many of the functions previously undertaken by Arts NSW and Screen NSW. Regional Arts NSW T: 02 9270 2500 E: admin@regionalartsnsw.com.au W: regionalartsnsw.com.au Regional Arts NSW is the peak body and support agency for arts and cultural development in NSW. They work together with the fourteen independent regional arts boards of NSW to address the challenge of diversity across the state. RANSW recognise that the voice of regional communities is at the heart of our cultural identity. Their vision is to build positive futures through enriching the arts and cultural lives of those living in regional, rural and remote areas. Ministry for the Arts T: 02 6141 6666 E: firstname.lastname@arts.gov.au W: arts.gov.au/indigenous/ivais The Ministry for the Arts is structured into four branches to deliver programs and policies that encourage excellence in art, support for cultural heritage and public access to arts and culture. The Indigenous Visual Arts Industry Support program aims to support and develop professional Indigenous arts practice, and build a stronger Indigenous visual arts sector. Arts Northern Rivers Indigenous Arts program is supported through the Ministry’s Indigenous Visual Arts Industry Support program. Ballina Shire Council T: 02 6612 3456 E: council@ballina.nsw.gov.au W: ballina.nsw.gov.au At the mouth of the Richmond River is the town of Ballina, the commercial and cultural heart of the area. The streets are lined with stylish restaurants and cafes where you can sample fresh local seafood and cuisine. The town is absolutely brimming with things to do and see… visit the Ballina Naval and Maritime Museum, discover treasure troves of antique and curios, art and craft shops and markets; browse the boutiques, stroll the magnificent Kerry Saxby river walk and bike paths, or take your pick of fun activities for the kids. Byron Shire Council T: 02 6626 7000 E: council@byron.nsw.gov.au W: byron.nsw.gov.au From the lush hinterland to the sparkling beaches on the coast, the region is full of natural wonders. Byron Bay is a melting pot of surf culture, alternative philosophies and hedonistic indulgence. Byron Bay’s natural credentials are impeccable as humpback whales cruise past the headland, storms create rainbows on the mountains across the bay and hang-gliders ride the thermals above the lighthouse. The laid-back towns of Brunswick Heads, plus the arts-loving villages of Bangalow and Mullumbimby, combine the casual vibe of coastal retreats with a touch of city style. Clarence Council T: 02 6632 1611 E: council@kyogle.nsw.gov.au W: clarencevalley.nsw.gov.au The Clarence Valley makes up around 51% of the Northern Rivers region of New South Wales – stretching from Hernani in the South to Baryulgil in the North and includes over 10,440 square kilometres of rugged mountains, the spectacular Clarence River and magnificent, unspoilt beaches. The physical beauty of this region is reflected in the creative community that calls the Clarence Valley home. The output of this dynamic sector is huge and has led the State Government to recognise the Northern Rivers region as a creative industries hotspot, which contributes significantly to the economy. Kyogle Council T: 02 6632 1611 E: council@kyogle.nsw.gov.au W: kyogle.nsw.gov.au Kyogle Council services an area of 3,589 square kilometres and adjoins the Scenic Rim Council in Queensland and the Northern Rivers Shires of Tweed, Lismore, Richmond Valley, Clarence Valley and Tenterfield in New South Wales. Kyogle Council comprises a large and diverse region with spectacular natural (including the renowned Border Ranges National Park and other world heritage listed areas) and cultural attributes. Lismore City Council T: 1300 878 387 E: council@lismore.nsw.gov.au W: lismore.nsw.gov.au Tucked away in the far north eastern pocket of NSW, Australia is Lismore, Nimbin & villages. An area renowned for its extraordinary natural beauty, amazing cultural diversity, relaxed lifestyles and quirky charms; a place where old school blends with new age and nature sets the pace. Lismore and Nimbin are on the doorstep of several magnificent World Heritage National Parks offering easy access to walking trails, waterfalls that cascade into clear mountain pools and breathtaking lookouts. Ancient rainforests shroud the hills, ridges and valleys of the Nightcap and Border Ranges National Parks. Richmond Valley Council T: 02 6660 0300 E: council@richmondvalley.nsw.gov.au W: richmondvalley.nsw.gov.au The Richmond Valley Council area extends from the coastline at Evans Head to the foothills of the Great Dividing Range to the West, interspersed with state forests, national parks and nature reserves. The main town is Casino with other communities comprising: Broadwater (436), Evans Head, New Italy, Woodburn and Rappville.